On a recent trip down to Singapore to visit my adorable nieces, I noticed a lot of steamed muffins being sold. Aha....this must be the latest food fad in food-fad-mad Singapore. This is one uniquely Singaporean trait - be it apple strudel, bubble tea, doughnuts, ramen, or Hello Kitty plush toys - come the latest fad, you will find Singaporeans queueing for hours to purchase the product and proudly sharing their find (spoils?) with all and sundry. Then you'll find restaurants and kiosks sprouting up like lallang after the rain, all selling the same stuff. And just as sudden as the next thunderstorm, it'll die down when the next new kid on the block comes along. Economics 101, the law of supply and demand; real-life demo. To be fair, you do get the same behaviour in Malaysia, but somehow just not as intense and frenzied. Anyway, back to the steamed muffins - these looked very Japanese (very cute, pastel colours) and came in flavours like corn, melon (? ), chocolate, cheese and pumpkin. 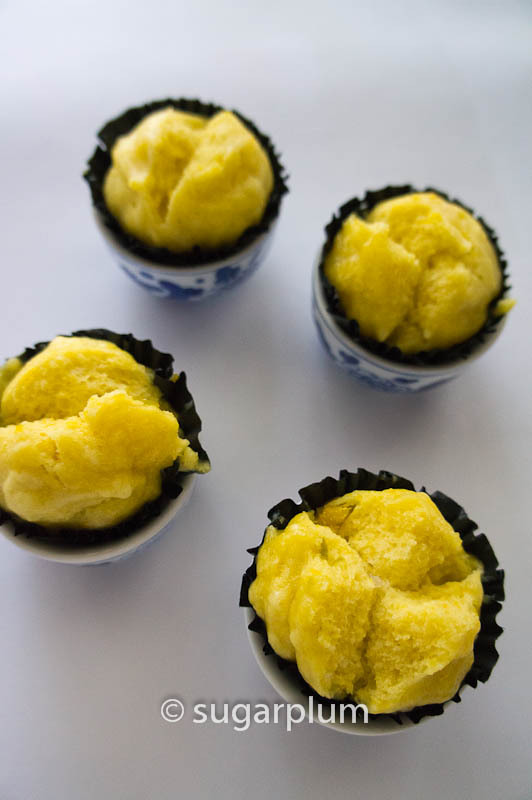 I couldn't resist trying some and found them quite delightful - almost like a Chinese steamed cake (鸡蛋糕). And because they are steamed, the flavour and texture are actually way lighter than baked products. Quite suitable for the little kiddies, whom by the way are super cute. Did I mention that I adore them? 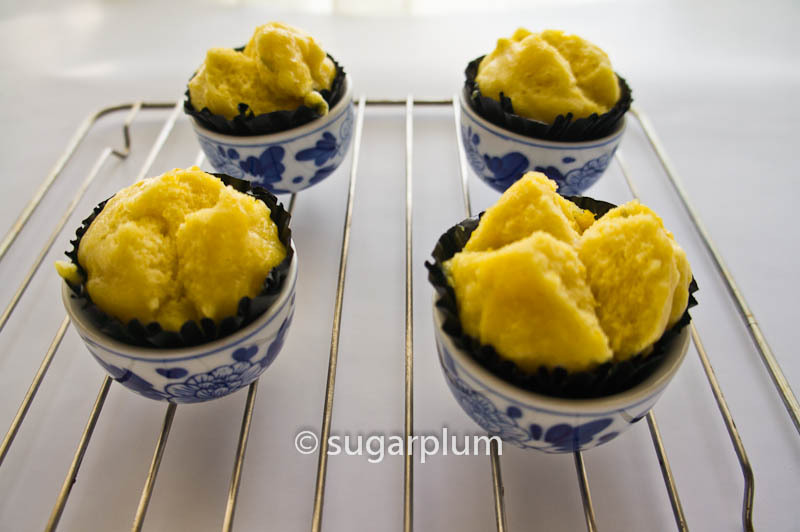 I found this lovely steamed pumpkin muffins from food4tots. It uses mashed pumpkin and the extra zing comes from adding coconut milk into the recipe. 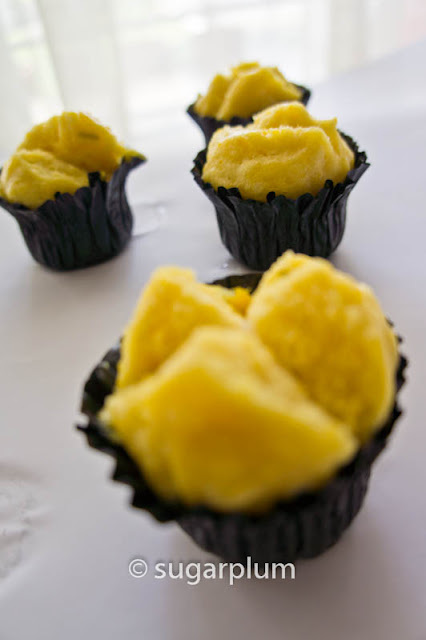 The coconut milk gives the muffins a sweeter lemak flavour which complements the pumpkin mash. It is also very easy to make because it uses what I describe as the 'muffin method' - add wet to dry, stir and pour. I mean, how much simpler can it get? As it uses double action baking powder, you can be assured of a good rise and my muffins 'smiled'. Huat-ah....(that's the homonym for rise and prosper, so symbolically very nice too). Although I confess to helping them along the smile journey - I scored the tops of the batter before steaming and these helped to split the tops of the muffins. You will notice I used teacups instead of muffin pans. Well, muffin pans wouldn't fit into the steamer, so I improvised. The old adage with the mountain and Muhammad thing. 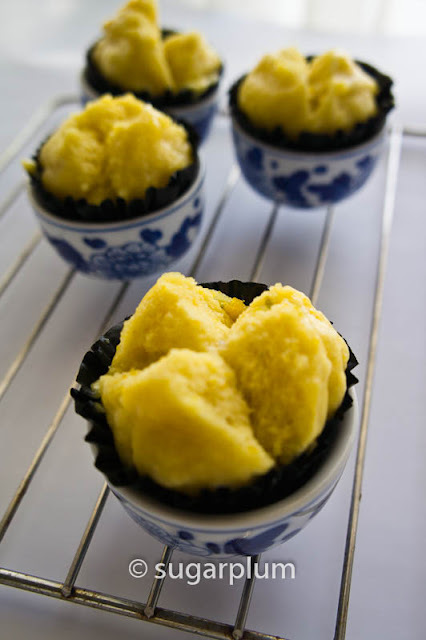 Teacups are traditionally used to steam huat kueh anyway, so they sufficed. I thought they looked quite cute too. What do you think? PS - the current fad in KL is Bubble Tea resurrected. Are you a fan? 1. Prepare a steamer for steaming the muffins and line 8 teacups with muffin liners. 2. Remove the skin from pumpkin, cut into small cubes, steam and mash. 3. Sieve the cake flour and baking powder into a large mixing bowl. 4. In another mixing bowl, whisk the egg until foamy. 5. Add in sugar and salt. Continue beating until well combined and the sugar and salt are dissolved. 6. Stir in coconut milk first, then oil and lastly mashed pumpkin. Stir well until evenly incorporated. 7. Make a well in the middle of the flour mixture. Pour the wet mixture into the flour in 2-3 batches. Use a spatula to fold in the flour. 8. Spoon the batter into the lined moulds until 80% full. If you want them to 'smile', use a knife and score the top of the batter with an 'X' design. 9. Steam on high heat for about 15 minutes. Check by inserting a skewer into a muffin. It should come out clean. 10. Once done, remove the muffins from the steamer and cool on a wire rack. 1. Extra muffins can be stored in the freezer. To reheat, just steam them up again. But they tend to dehydrate easily so you may want to serve with some jam on the side. 2. I used a ladle to spoon the batter into the muffin liners. It's easier and you get a consistent volume. 3. You could use ramekins instead of teacups or whatever that will hold a muffin liner. The muffin needs a mould to hold its shape otherwise you'll end up with an unsightly steamed amoeba-like puddle. Wow! I really LOVE the smiling effect of your muffins. It's really a great idea to put them into teacups. May I know what did you use to score your muffin top? Thanks! I used a knife to score the muffin batter. It's just like scoring bread dough for that slashed effect. Thanks for the great tip! I shall share it in my post.